This hot weather in LA is giving me Cabin Fever! With my wardrobe that is... I'm ready to pull out jeans, scarves, chunky knits, and most importantly - boots! I can't wait to show you guys my deal of a century that I shared last week on Twitter. I'm sure that you can guess from this post that they're a pair of riding boots - I scored them from DSW last week while visiting my family. They're was one teeny tiny thing wrong with them so I'm picking them up tomorrow from my shoe guy. You're seriously going to die when I tell you about them. Until then... here are my inspiring photos I've been pinning of ways I can wear my new babies.... Don't forget to follow me on pinterest too! What are you wearing your riding boots with? Inspire me! Ah I LOVE riding boots--make me SO excited for Fall! I like to wear mine with feminine dresses to mix it up a bit! 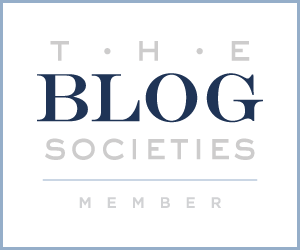 I'm so glad you stopped by my blog because now I have found yours :) I'm excited to be your newest follower via GFC and Bloglovin! I hope you stop by my blog again so we can stay in touch darling! I feel the same way about this weather! I want to wear all my fabulous boots with dresses,skirts and jeans!! go away sun! I adore a good pair of riding boots!! Love these options. Gorgeous inspiration pics! 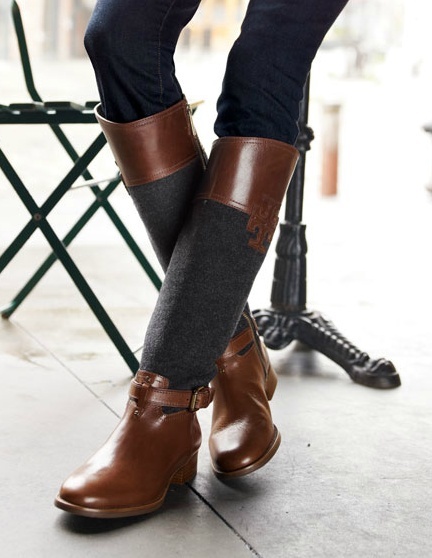 I'm still on the hunt for my perfect dark brown riding boots too, and now I'm more excited than ever to find them! 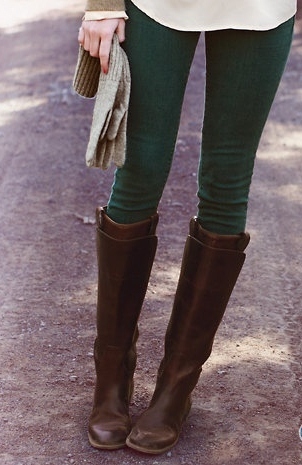 I love the horse print sweater look and the boots with the hunter green jeans - so cozy! Cute post! I just bought some new riding boots and this is great for finding inspiration :)Thanks for sharing! Where can I get the boots pictured that are two tone. Tan with what looks like dark grey or denim. I love the detail at the top of the boot. These are amazing boots.